Eighty-five percent of kids head injuries can be prevented from a properly fitted helmet! When preparing to ride a bicycle, there are a few major precautions that must be taken. The most important precaution to take is making sure that your helmet fits properly. Not only is wearing a helmet extremely important, but wearing a helmet that fits properly is the most crucial. 1. Purchase a helmet that is in relevant size to your head. It needs to feel secure and without movement when you move your head from side to side. Each helmet will come with pads that can be applied to the insides to insure a snug and reliable fit. 2. The position of the helmet should be in the middle of your forehead. If it is fitted too closely to your eyebrows then proper safety will not take place. 3. The side straps should be proportional to your ears and form a “V” at the bottom of each ear lobe. Once they are comfortable, secure the lock into place. 4. Lastly, the chin buckle should be directly beneath your chin. You shouldn’t be able to fit more than two fingers in the gap between your chin and the strap, but make sure it isn’t too tight as well. 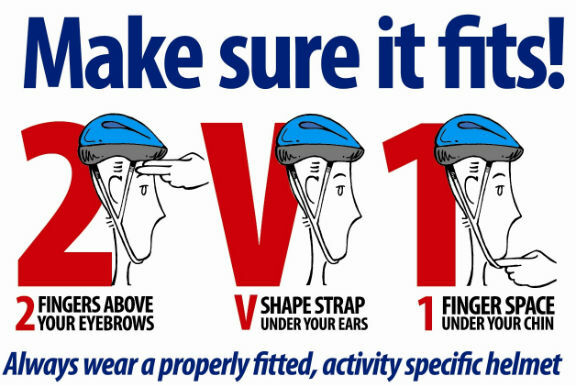 If these steps are taken prior to embarking on each bicycle journey, your helmet will always fit properly and keep you safe in the instance that an accident were to occur.